If you’re a fan of classic-style hard science fiction, circa early Asimov and peak Arthur C. Clarke, this is a tale you should grab and enjoy at your first opportunity. Your purchase gets you not only the title novella itself but also a short piece that explores some of the secondary themes in the main work. It’s a decent story on its own right, but as a glimpse into the creative process, it’s even more intriguing. I’m a person who listens to director commentary on movies and watches all the deleted scenes, so having a behind-the-scenes extra on a written story appealed in the same way. It was a delightful addition, like a light dessert after a tasty meal. Speaking of food analogies, this one is a nice, tasty casserole, rich with flavors and textures. Some of the ingredients aren’t to my taste, but they’re well-mixed and topped with a crunchy crust. There’s even a touch of spice. As I said, it’s a very classic presentation, but there are romance elements–deftly handled and realistically described ones–that far exceed what I remember anyone in the old school putting to page. I enjoyed the addition. I’m a demanding reader. If an item is offered for sale, I expect it to meet professional standards in its overall presentation, writing quality, editing, and formatting. Dry Land met all those standards with flying colors, and that’s no small accomplishment for a self-published work. At no point did grammar gaffes, typos, or awkward prose yank me out of of the story, and that’s rare indeed. I can’t say those errors were absent entirely, and the prose could use polish, but the words didn’t make me roll my eyes too often, and I never laughed at a phrase that wasn’t meant to be funny. And when it comes to errors, well. I finished a traditionally-published, professionally-edited bestselling novel today that had 3 major gaffes in the first chapter. Nuff said. I wait before reviewing, because a story that doesn’t stick in my memory is not as good as one that does. 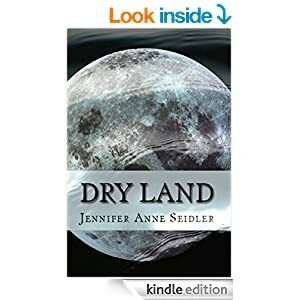 The main character and the plot twists of Dry Land stuck with me. I was thinking about them well after I finished reading, and that’s a telling sign of quality. This is a space story more than a sweeping science-fiction one — not that there isn’t science, there is, but the life sciences get only a nod while the wonders of near-space get pompoms and a fanfare. The astronomical descriptions and the fundamental physics necessary for the plot are offered with the passion of a true believer in humanity’s future in the heavens. The depth of research informs the plot rather than overwhelming it; a hard balance to achieve, but the author does an excellent job. It’s hard scifi, in that the plot progression takes precedence over character development, but the broad sketches of character traits skated the edge of stereotype, for the most part. The protagonist’s emotional struggles are realistic, and interpersonal conflicts arise organically from the personalities of the characters. There’s not much I can say about the plot without spoiling the read. The story is delightfully twisty, and getting into specifics would spoil the reveals. The plot elements are also where my main dissatisfactions lie. Call it a disagreement on premises. I feel that the existence of some elements render the likelihood of other events flatly unrealistic. The main foundation of the whole story rests on a base that shook my suspension of disbelief the way an earthquake rolls skyscrapers. That said, it’s no more absurd than many a movie premise I’ve enjoyed even while scoffing at its impossibility, so I set aside my objection and enjoyed the ride all the way to a beautifully constructed finale. As a wrap, I’ll acknowledge that I was offered a free copy for review, but after I finished, I purchased a copy of my own. I’m a cheapskate. Voting with my wallet is the second-highest praise I can offer an author Recommending the book to others is the highest level. I’ve done both with this one. Bookmark this author’s Amazon page. You do not want to miss her next one.